Fall is almost here and I’m not ready for it. Many of you are ready to wear your layers, chunky knits, boots and jackets while drinking your pumpkin spiced late. I want to hold onto summer as long as I can but I am ready to slowly introduce a couple of those cold weather items to my existing wardrobe. 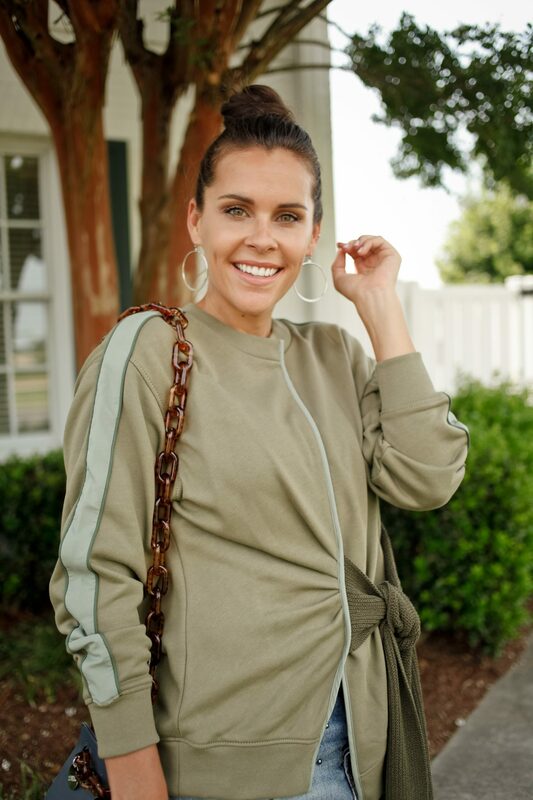 Last season I talked about the easiest way to transition your outfit in this post. I still use that advice for my fall wardrobe. This year I’m wearing todays trend of the denim skirt and I am kinda feeling like I should be a freshman in college again! Tortoise shell print can be found on just about anything these days, from sunglasses and phone cases to shoes and belts, this print is even popping up on handbag handles all over. From designer bags that cost over $2000 to afordable bags under $40 this trend is one of my favorites for all year round. This knot detail is perfection. Years ago I owned multiple denim skirts (the ones from Hollister that every girl in my dorm owned – Abercrombie if we were lucky!) and I gave them away a few years ago. What was I thinking!? That seems to be the case with everything, just when I decide to get rid of it, it comes back in style. Anyways, this studded skirt (on major sale here!) belongs in my closet. I used to be stud obsessed, if it had studs on it, I had to have it. This skit will be my transitional fall staple piece. 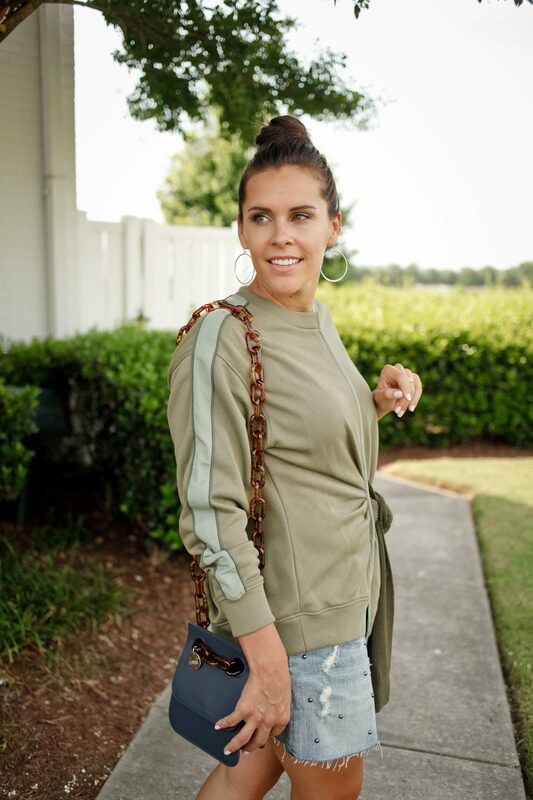 I love how it looks with this sweatshirt and it will go with just about every chunky sweater I own. Wondering what shoes to wear with your denim skirt? I had that question too. If you are wearing a mini denim skirt like this one year stick to booties or sneakers.